I got this idea when I was watching Nigella Lawson make these little chicken pot pies. She made them in a pair of medium sized ramekins topping them with Pillsbury grand biscuits. She popped the tin of biscuits and taking one to an floured surface proceeded to roll it out flat and used it to top the pie. Brilliant! I’ve since copied that idea and I’ve found the ‘Pillsbury’ solution to have a set of long legs using it for a couple of different cooking projects where a quick, little bit of dough was needed. But I digress as today’s cooking project focuses not on the dough, but I’m the individual portion piece. 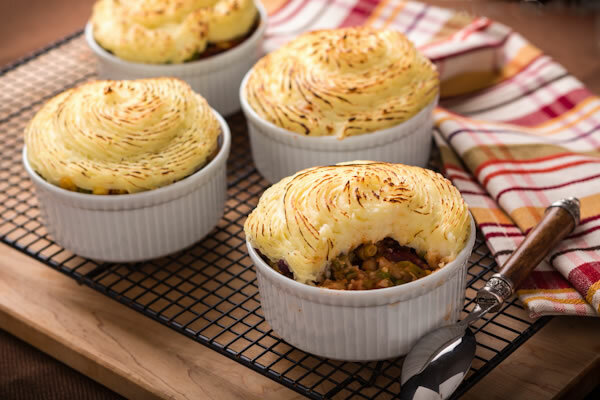 Today its Sheppard’s pie in wide stoneware mugs. Heat the oil in the skillet over a medium heat. Add the onions and carrots and cook, covered, until the vegetables begin to soften, about 8 minutes. Raise the heat to moderately-high. Add the mushrooms and thyme and cook, uncovered and stirring occasionally, until the mushrooms are soft and their liquid has evaporated, about 8 more minutes. Return the meat to the pan. Add the flour and cook, stirring, for 2 minutes. Stir in the broth, 1/2 teaspoon of the salt and 1/8 teaspoon of pepper and bring to a simmer being sure to scrape up any brown bits from the bottom of the pan. Stir in the peas. Pour the mixture into four stoneware mugs. Preheat the oven to 350 degrees F. Scrub the potatoes and cut into 2-inch pieces. Arrange the potatoes in a steamer basket, and steam for 10 minutes. Are tender when pierced with the tip of a knife, about 15 minutes longer, then with a potato masher until smooth. Heat the butter, the remaining 1/2 teaspoon of salt and a pinch of pepper and stir into the potato mixture. Use these whipped potatoes to top the mugs and cook them in the oven for about twenty minutes. I like to serve these as an accompanying dish with hot corned beef sandwiches. I was up in Great Neck the other day. It’s a nice drive north of here and there is a little Polish deli just outside of town. I happen to like this little mom and pop shop for its old world charm, with every nook and cranny filled with imports mostly from Poland and a couple of other Slavic countries. They have a wonderful homemade stuffed cabbage with tomato sauce. But I’ve come up for kielbasa. A nice foot long cured pork sausage smoked to perfection. 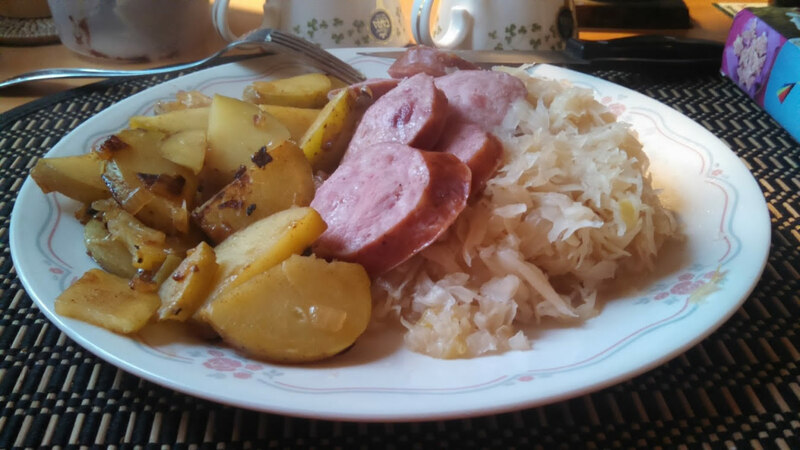 Cooked in a deep pan of sauerkraut it goes so nicely with home fried potatoes seasoned with Hungarian smoked paprika. In a small pot bring the potatoes to a boil and cook then just a couple of minutes… Don’t let them get too soft… When you can pierce them neatly with a knife, take then out and let them cool in the fridge. Open the jar or can of sauerkraut add empty it juice and all into a deep pan. Now, you can cut up the kielbasa not and add it to the kraut or, if you plan allows, cook it whole and slice it later, its completely your call. In either case get the kielbasa in there, cover the pan and simmer this over a low heat. Cut up the bacon and add it to a fry pan. Dice the onion and toss that in sauté a few minutes over a medium heat. Dice the potato’s and toss them into a bowl. Add a bit of olive oil a couple of tea spoons should do, just to give them a coating to focus heat and help the paprika adhere. Add the paprika, salt and pepper to taste and mix it well to coat the potatoes. Then, toss the mixture in with the onion and bacon. Sauté until the potatoes are nice and tender. Check the kielbasa, and these should be done at about the same time. All it takes now is to plate it up and get out to the guest! Serve this with a nice beer. Prost!